"That Thing Called Tadhana" has currently reached 130 Million Gross Sales on it's fourth week. 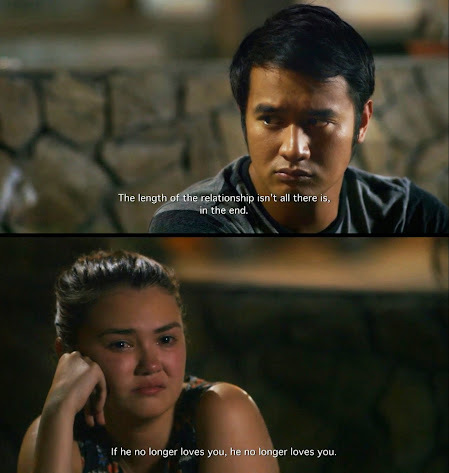 So what's the fuzz over this film directed by Antoinette Jadaone and starred by Angelica Panganiban as Mace Castillo and JM De Guzman as Anthony Lagdameo? Tamang tama kasi mga patama sa mga hugot lines eh... relata diba? Patama #1: Pag Hindi Ka Mahal Wala Kang Magagawa! Patama #2: Gawin mo ang lahat para hindi ka magsisi. Push mo lang yan. Patama #3: Tanga tayo pagdating sa pag-ibig. Patama #4: Mahirap pero makakamove-on ka rin. Anthony: “Hindi ko rin alam. Nagising nalang ako isang araw. Wala na siya. 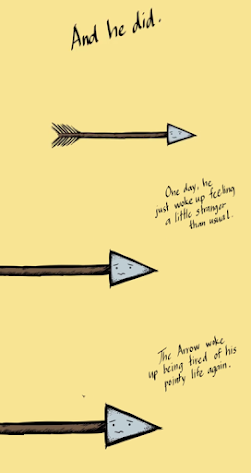 “Excuse me but have you lost your heart?”, the arrow was surprised, it was the heart who used to be pierced through him—and there was no reply. 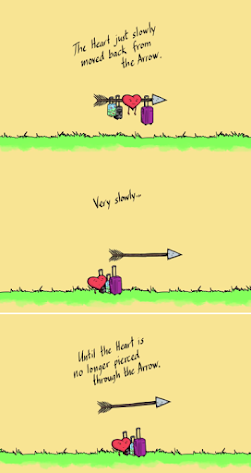 The arrow and the heart didn’t need any. Patama #5: Magulo ang tadhana. Pwedeng pinagtagpo at tumungo sa pag-ibig, pwedeng panandiliang sandalan lang. “Where do broken hearts go nga ba talaga, tita Whitney? Patama #6: Walang kinalaman sa pagbreabreak up niyo ang itsura mo. Patama #7: Pero may perks talaga ang pagiging maganda. Patama #8: Maraming klaseng pag-ibig. Patama #9: Wag kasi assuming. Wag magmagaling. Patama #10: Mahirap pigilan magstalk sa mga ex...aminin mo man o hindi. Business process outsourcing (BPO) service provider, Open Access BPO, was founded in 2006 as a telemarketing startup in San Carlos, California. The company moved its operations to its current facilities in Makati City a year later where it began expanding its services. This was a strategic move that was driven by the Philippines' potential as an outsourcing hub. As one of today's fastest growing outsourcing companies, Open Access BPO's lineup of services include customer care and technical support, telesales, content and social media moderation, data entry, and other back office solutions. In addition to this, the company recently added multilingual customer support to its growing portfolio of services, enabling it to offer its voice and non-voice-based solutions in 27 languages. Unlike most outsourcing companies that offer package deals with pre-selected services, Open Access BPO employs a boutique-style approach that lets its clients customize the solutions they outsource. To ensure that the resulting business solutions meet every client's unique demands, the company works closely with them for all aspects of the campaign—from development, to deployment and its daily operations. Another key aspect that fuels the company's continuous growth is its employees. Open Access BPO only hires the best workers for its outsourcing functions, with each employee undergoing rigorous training before eventually graduating to the production floor. The Philippines, a multicultural nation, and its bilingual population have driven the company's array of operations. First were the English-proficient employees, followed by those who are fluent in the aforementioned languages that the company supports—all empowering the company's international clients. Satellite facilities in Taiwan were recently established to further strengthen its Chinese-based services. With over 600 employees operating out of its facilities in the US and Asia, Open Access BPO clients include global businesses of all sizes, including Fortune 500 corporations. Watch out for the upcoming biggest Zumba party! The Dance Recover Repeat (DRR) is sure to create a unique and energizing experience. The 3-Hour Pre-Summer Themed Zumba Party aims to hold a party with more than 1,500 fitness enthusiasts from different fitness centers, schools and universities, call centers, government and private companies and all other individuals. 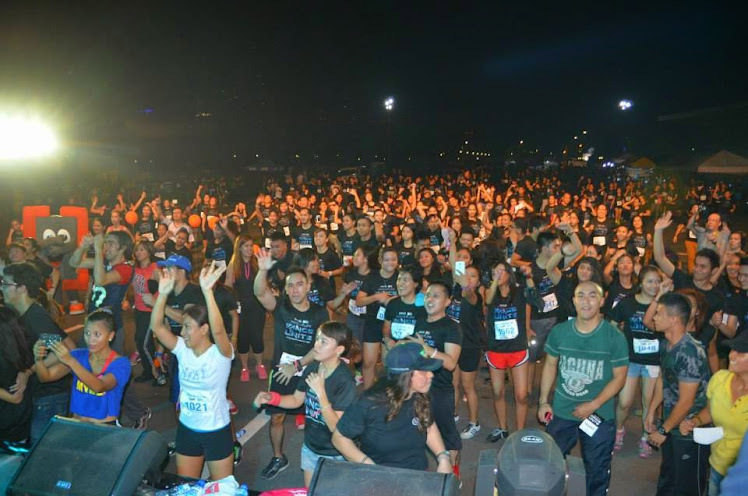 Dance Recover Repeat (DRR) is organized by 4.0 management, the same company that organized the two biggest Zumba Fitness events in 2014: Fuse and Dance for Life: Dance Unite. Fuse, was held on September 26, at the CCP Folk Arts Theater. 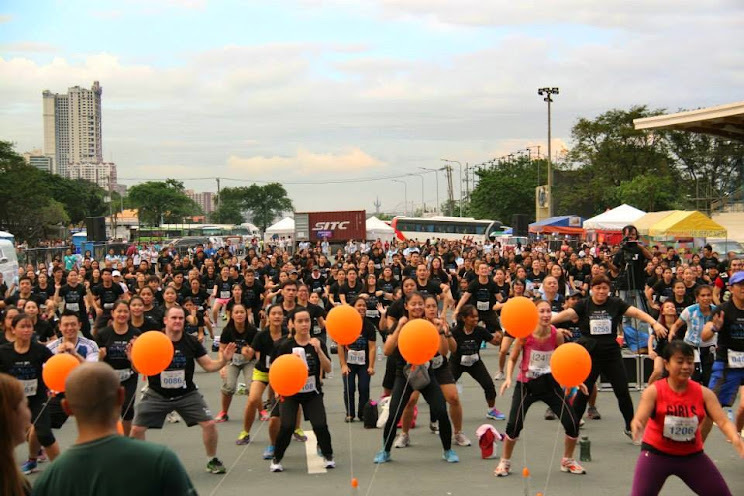 With more than 100 Certified Zumba (ZIN) Instructors from all over Luzon and joined by 3 popular Zumba celebrities Regine Tolentino, Joshua Zamora and Ray-AN of G-Force, it lasted for 2 hours with participants having fun throughout. So what are you waiting for? 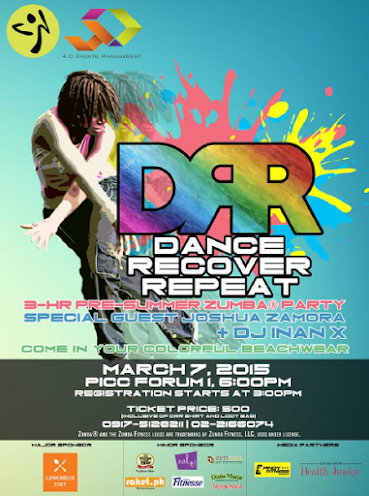 Register now for the Dance Recover Repeat (DRR) that will be held on March 07, 2015 at the Phil. International Convention Center (PICC) Forum 1, CCP Complex, Pasay City. With special guest Joshua Zamora and DJ Inan X and the more than 100 Certified Zumba (ZIN) Instructors, the party is sure to be a blast. Registration starts at 3:00 PM Zumba® Party starts at 6:00 PM. This event is made possible by the following sponsors: Lunchbox Diet, Mega Fiber, Raket.PH, Nail It, Nestle Fitnesse, Dona Maria Jasponica and Zen Asia Massage Spa. Celebrating Chinese New Year is a big and special part of our Tsinoy culture. 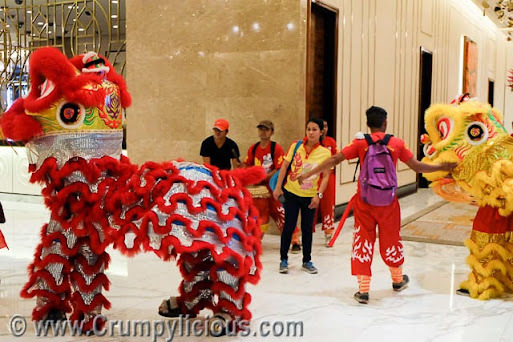 Thus, I decided to join in the festivities at Solaire Resort and Casino where I witnessed the Lion Dance. Nothing is more nostalgic to me in welcoming the Chinese New Year than the long and colorful dancing dragon as it chases the "Pearl of Wisdom", the dancing lions, the laughing Buddha and the heart-pounding sound of the beating drums. Starting from the VIP entrance towards the main lobby and various areas of the resort, the dancers exhibited their acrobatic prowess. There is also a lighting of the money tree at the Resort's atrium. Join in the festivities as Solaire Resort offers a Chinese New Year Weekend Package that's perfect for the family. For only P8,888++ per night inclusive of complimentary parking, wifi access and shuttle service to major shopping malls and P500 gaming credits per adult guest. The package is available until February 21, 2014 for local residents. Of course, a celebration must have a lavishing feast. Chef Chaw of Red Lantern presents a special a la carte menu of various Chinese delicacies such as Braised Pork Trotter with Chinese Mushrooms and Black See Moss, Sauteed Prawns with Vegetables and X.O. Sauce and Salmon Fish "Yee Sang" and much more. 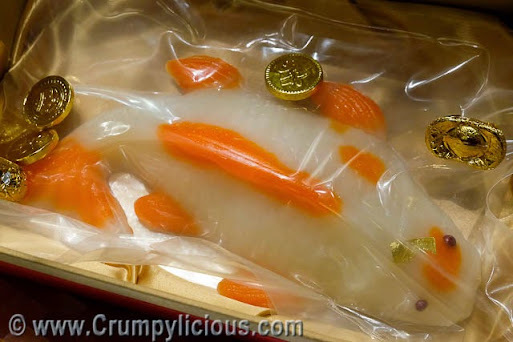 You can also purchase the Koi-Fish shaped tikoy at Red Lantern for only P599. The fish symbolizes a plentiful year and tikoy (nian gao) symbolizes a higher year and the stickiness for closer family ties. In you're cooking it at home, you can use my Tikoy and Egg recipe and Deep-fried Chinese Lumpia Roll Recipe. Red Lantern also offers the CNY Cookies for P 499.